Height Range: 18" - 35"
Note: The addition of casters adds 6" to the overall width of the table. 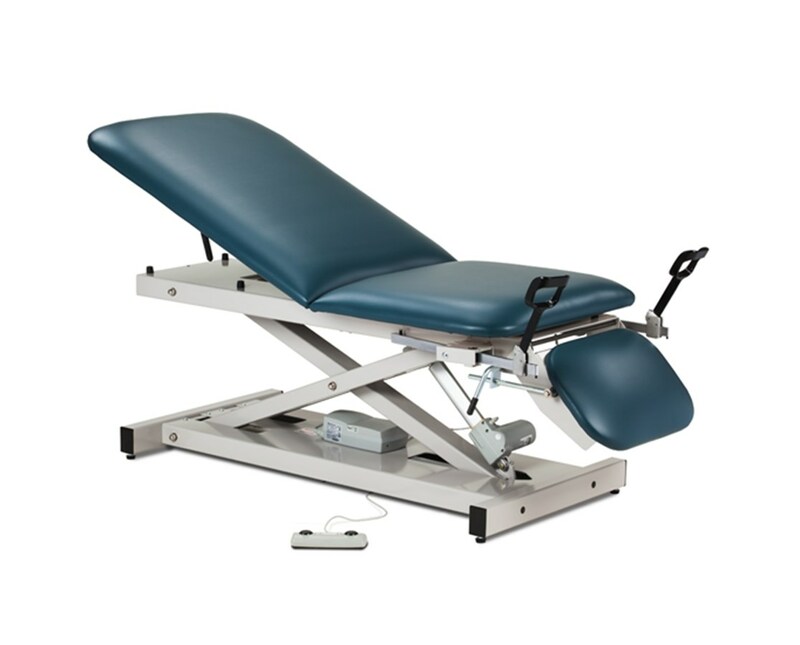 The Clinton Open Base Power Table with Adjustable Backrest, Footrest & Stirrups offers ultra strong construction, user-friendly mechanism and provides a rigid patient platform. 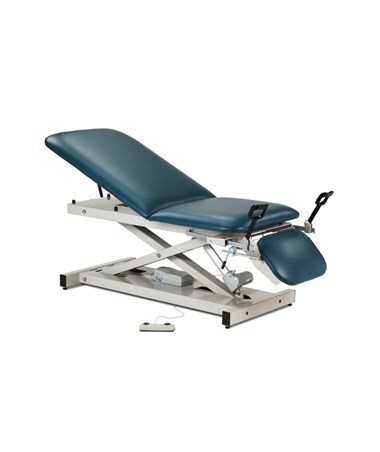 Table Features: The Open Base Power Table with Adjustable Backrest, Footrest & Stirrups features a pneumatic backrest offering smooth and effortless adjustments. The backrest and footrest is adjustable from either side and raises 80 degrees from a flat surface. A convenient foot control operates the electric power height adjustments. This table includes retractable stirrups. The stirrups are length adjustable and provide 2 position options. Table Frame: Clinton produces an ultra-strong, uni-frame base with top construction. The table top is built with 3/4” of plywood top for extra support. The durable gray powder-coated steel frame is guaranteed to offer you years of service. This table's low height may help achieve an ADA tax credit. Capacity: The Power Table accommodates up to 450 lbs. Options: The Power Casting Table is available in 21 attractive colors with a variety of table options. Please review your choices below and select your preference by clicking on the Customize icon above. Table Height 18" - 35"